Rome is that city that you have dreamed of since childhood. It is the capital of Italy and appropriately nick-named The Eternal City. Rome is home to many of the great monuments you learn about in school and marvel at in photos and other artwork. It overflows with history, artwork, architecture and culture. Rome is a massive cosmopolitan woven together with tiny roads and alley-ways filled with all the fine dining, local haunts, luxury shopping and artisanal boutiques you can possibly imagine. Mixed within everyday life, are pockets of ancient history telling the story of the first Romans. For example, stroll Via Condotti and window shop down one of the most famous luxury shopping streets in the world. When you think you’re done, look out across the square and you’ll be staring at the Spanish Steps! The Eternal City, a perfect combination of ancient and modern, will surprise you at every turn with something beautiful. After a jam-packed day in Venice, the three and a half hour journey to Rome by train is welcomed. Tip: If you are traveling Italy, I highly recommend booking fast trains in advance. It will save you hours of travel time! I used RailEurope to book all of our trains a month in advance. This did put us on an arrival/departure schedule when going from city to city, but leaving Venice is the only time we ran into an issue and the time saved was well worth booking specific trains. We should be arriving in Rome at 2:10 and plan to see a few sites before dinner after we settle in. Nothing went majorly wrong that morning, but everything did go just a tiny bit wrong. With each tiny, otherwise insignificant hiccup grew a very desperate situation. Our train was scheduled to depart San Lucia station at 10:25 am. Between walking to the vaporetto stop and riding over, it should have taken us about 15 minutes. So, to make sure we were not late, I planned for us to be out the hotel door by 9:50. That gives us a 20 minute cushion in case it takes a little longer. The first tiny, insignificant delay was checking out. It took a couple extra minutes but no big deal! Walk. We head out to the vaporetto stop and we are just in time to catch the ferry. We scan our tickets and….nothing. They expired! We had a 24-hour pass and our 24 hours had expired about an hour earlier. Buy new tickets. By the time we are able to purchase a single pass for each of us, the ferry was gone. No big deal. Another one will be here in a few minutes. The ferry arrives and we board. At this point, I am feeling relieved because I was starting to get a little antsy on time. We stop. Why are we stopped? The ferry in front of us is delayed at the next stop and we can’t pull in. Great! So, here we are just waiting. We finally get going again but now we are really starting to crunch time. Finally, we arrive at the dock in front of the train station and who is in front of me other than THE. SLOWEST. INDIVIDUAL. ON. THE. PLANET! He scolds me for rushing. Ugh. It is approximately 10:22 at this point and we aren’t even into the station. Speed-walk. I get to the boards, 10:24 am and find our platform. Of course, it is the furthest one! Run. We are racing down the platform. Somewhat relieved that the train is still there, but frantic as we sprint with luggage in hand. Thank the Lord that we only packed carry-on suitcases and backpacks! We are in car 9. Car 9 feels like a mile away. The Whistle. We’re almost there. The second whistle. Oh, crap! This is the point where you just need to find a door. Any door! Actually, it is the part where you should already be comfortably seated aboard the train. It is also the part where your heart falls into your stomach. Jump. We hop on the train using the closest doors and realize just how close we were as they immediately shut behind us. I still can’t breathe. Not because I am stressed out, but because I just sprinted with about 60 pounds of luggage! We took a minute to catch our breath and made a seemingly very long trek through the train. I’m not sure how many cars we had to walk through to get to ours, but it was several. We were lucky enough to sit by a very sweet American couple who could laugh with us and share stories of their own near misfortune in rail travel. The next few hours was spent chatting, journaling and soaking in some Tuscan countryside as we rode through. The Tuscany region is a stop later on in our journey, but these views give us something to look forward too! Right now we are headed to the big city! Tip: If you need a cab, be sure that you go directly to the taxi cab in front of the station and take an official taxi. Don’t follow anyone offering a ride – they will rip you off. Those guys are generally to the left and will rip you off. Real cabs don’t get out of their vehicle and you can’t hail a cab like you do in the States. If you want a ride, you have to call or go to a nearby taxi stand. A cab from Roma Termini to your hotel should cost between 15 and 20 euros. Tips are not necessary, but 1 euro per bag is customary. Also, confirm the meter is working. If the meter isn’t working, ask to get out and find another cab. Almost immediately, we have a “cab driver” approach us and offer a ride but we kindly decline and head toward the taxi post. The taxi posts are the locations where you can be picked up if you haven’t called a cab. It is better to find one of these than to call because, if you call, the meter starts running from wherever you are. In other words, it is more expensive to call. These stands are all over the place so just keep your eyes peeled! For our three nights in Rome, we will be staying at Albergo del Senato. A beautiful 3-Star hotel situated in Piazza della Rotonda, home of the Pantheon. I originally found this place on Tripadvisor and chose it based on price, locations and reviews. TripAdvisor is main spot to research hotels and read reviews and then I troll the internet to find the best deals for what I want. The first thing to learn about Italy is that it is almost always cheaper to book directly with the hotel. The only exception would be for major chain hotels, which I did not use on this trip. I am all about using services such as booking.com to save money, but I booked every hotel directly in Italy and it was because each one gave me the best deal to do so. Tip: Book non-chain hotels in Italy direct. The hotel will appreciate it and so will your checkbook. This is NOT a sponsored post, but I love this hotel so much that I am going to tell you why you should choose this place if you visit Rome! I really did love this place and it was a comfort to come “home” to after long, hot days in Rome. Albergo del Senato is perfectly located for touring the city. Seriously, everything was within reasonable walking distance with the exception of the Vatican and the Borghese. In addition to being perfectly located, the hotel faces the piazza and is caddy corner to the Pantheon. That means even looking out your hotel room is a treat! Comfort and amenities are on point and the staff is amazing and helpful. Even in the weeks prior to our arrival, they communicated by email answering questions and fulfilling requests such as transportation tips and dining reservations. I feel like they went above and beyond both before and after our trip. Someday, when I return to Rome, this place will definitely be my choice. We only have a few hours before our dinner reservation, but with such close proximity to so many sites we head out to enjoy a few. Heading over to Piazza Navona is first on our agenda. Tre Scalini is a little restaurant in Piazza Navona that I learned about through other blogs and they serve some amazing gelato! Piazza Navona is a well-known square in Rome and is home to several statues,sculptures and fountains including the most notable – The Fountain of Four Rivers. The Fountain of Four Rivers dates back to 1651 and is a work of Gian Bernini. Throughout Rome, you will find many other works of Bernini. He was kind of a big deal! As you wander, you’ll learn quickly why it is called The Eternal City. With over 3,000 years of history, you can’t walk 5 minutes without finding something incredible! The Pantheon has greater than 2,000 years worth of history and, even more remarkable, has remained in continuous use. Beginning as a Roman temple, it is now used a church – Santa Maria ad Martyres ( St. Mary and the Martyrs), or Santa Maria Rotonda for short. Another impressive fact about the Pantheon is that the ceiling remains the world’s largest unreinforced concrete dome. What’s changing at the Pantheon in 2018? After grabbing an aperitif and a gelato, we walk back toward the hotel to check out the Pantheon. Like many things, you simply cannot put it into perspective until you are there. It doesn’t take long to walk through, but it is definitely worth taking a few minutes to check out the inside. Keep your voice down though! Since it is also a church, they do expect you to be respectful and keep your voice down. Our next stop was the Trevi Fountain. With its most recent renovation completed in 2016, it is beautiful! The renovation cost approximately $2.4 million and was completed over the course of nearly a year and a half. 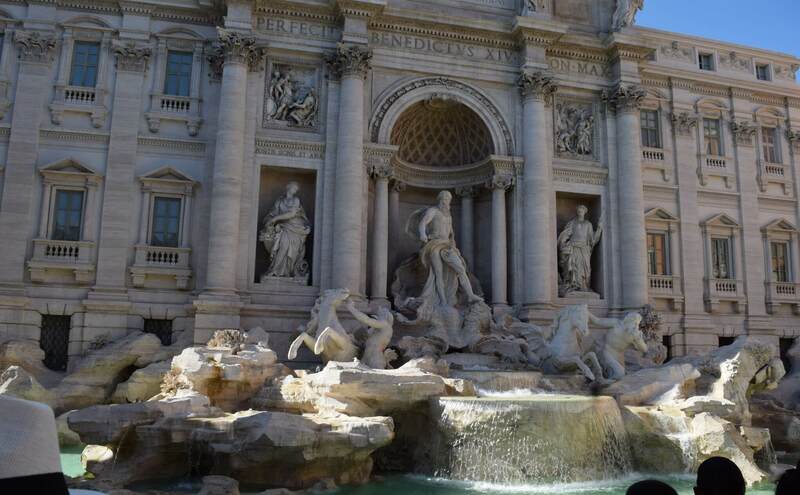 The project was funded by Fendi as part of the “Fendi for Fountains” project which aims to help preserve Roman history. The Trevi was about a ten minute walk from our hotel and this area is BUSY. On the way, we had a little fun with street vendors and scored us a couple of $15 tourist sun hats! As cheesy as it is, it turned out to be a $15 very well spent! Here is mine! Our last stop before dinner will be the Spanish Steps and then we will make our way back down Via Condotti. The Spanish Steps are a series of 135 steps leading up from Piazza di Spagna to Trinita dei Monti Church. At the time of construction between 1723 and 1725, the steps were intended to link the Bourbon Spanish Embassy to the Holy See for which the square was named. At the base of the steps, you will find the Fontana della Barcaccia or, The Fountain of the Ugly Boat. This is another baroque piece by the famous Bernini. Not a bad way to spend your first evening in The Eternal City! From the Spanish Steps, we made our way down Via Condotti and then on to Dinner. Tomorrow we have an early start with a tour of the Vatican, Sistine Chapel and St. Peter’s Basilica. Italy is one of our all time favorite places! I lived there for five months. I just love reading about other peoples adventures there! Thanks for sharing 🙂 Sounds like you had a wonderful time there. The Trevi Fountain looks so neat! I hope I can visit Rome someday. I was lucky enough to be in Italy for a few days, I had all of 1 day in Rome and couldn’t get to see too much. We managed to see the Colosseum and the outside of the Vatican! It was too late to enter. I loved being in Rome! Everywhere you look, there’s something to see. Do you have any recommendations on the best places to eat? So true! Yes, I had my favorite meal at a little local joint in Rome! Best pasta dish EVER. I will be posting soon about our two full days in Rome and will include food recommendations!! What a great recollection of your trip. Sounds like a busy few days! I have never been to Rome before, but it has so much history I feel like I would struggle to cap the trip at 2 days! So true about the taxis, they do the same in Paris and it’s definitely a rip off! thanks for pointing that out! Oh I love the eternal city. Rome is sooo beautiful. Fontana di Trevi is my favourite spot in Rome. Thank you for all your valuable tips! What a wonderful trip! Such stunning photos, and your hotel looks right in the middle of all the action. I haven’t been to Rome for years, but this has got me itching to go back! Rome is so beautiful! I cant wait to get there next year! You hit all my favorites in just one afternoon! Trevi Fountain is especially beautiful at night, though. Great tip that Tre Scalini has good gelato — I had such a hard time finding the good stuff in Rome. Pictorial post with impressive content, I liked lot. I have spent myself few days in Rome, love it.